Shane Koyczan: Talk Rocker was the first show to make me cry at the Fringe. There, I’ve said it. I’m not much of a crier normally. I have a reputation in my family for having a heart of stone. I didn’t even cry during the episode of The Royle Family where Nana dies. I’m basically subhuman. But Koyczan’s poetry did something to me. He had a difficult childhood: raised by his grandparents, bullied throughout his youth, but don’t think for one second his poems are maudlin. They’re authentic, wise, wry and sparklingly funny, despite the heart-wringing content. Koyczan doesn’t ‘milk’ his past but utilizes it to form poems of rare depth and insight into the human heart, from first love and night terrors to the bonds of friendship and heavy weight of bereavement. His delivery is understated, his quiet voice leaving audiences hanging on the lyrical beauty of his language. He seemed delighted that so many people turned up to hear him read. It’s touching to witness such a talented individual display genuine modesty. Shane Koyczan rocks. 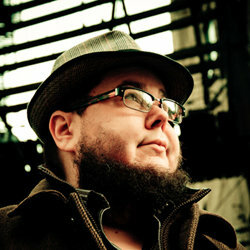 Shane Koyczan: Talk Rocker, Underbelly. Until 27 August, 7.30pm.